The Beatles topped the UK Album Chart for 155 weeks during the 1960s, longer than any other artist. The UK Albums Chart is a record chart based on weekly album sales in the United Kingdom; during the 1960s, a total of 57 albums reached number one. The sources are the Melody Maker chart until March 1960, and the Record Retailer chart from March 1960 onwards. 1 2 3 4 The artist, album, date of reaching number one and number of weeks at number one are those given by the OCC. 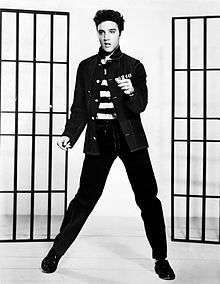 Elvis Presley spent 47 weeks at number one on the albums chart during the 1960s. 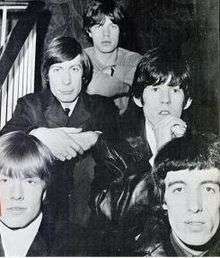 The Rolling Stones topped the UK Albums Chart with four different releases for 31 weeks. Six artists spent 20 weeks or more at number one on the albums chart during the 1960s. ↑ Includes three number-one albums co-credited with Cliff Richard. ↑ Co-credited with The Shadows. Eight record labels spent 20 weeks or more at number one on the albums chart during the 1960s. ↑ Warwick, Kutner & Brown 2004, p. 26–29. ↑ Mawer, Sharon. "Album Chart History: 1960". The Official UK Charts Company. Archived from the original on 4 July 2007. Retrieved 30 October 2010. ↑ Mawer, Sharon. "Album Chart History: 1961". The Official UK Charts Company. Archived from the original on 4 July 2007. Retrieved 7 June 2011. ↑ Mawer, Sharon. "Album Chart History: 1962". The Official UK Charts Company. Archived from the original on 29 July 2007. Retrieved 7 June 2011. ↑ Mawer, Sharon. "Album Chart History: 1963". The Official UK Charts Company. Archived from the original on 29 July 2007. Retrieved 7 June 2011. ↑ Mawer, Sharon. "Album Chart History: 1964". The Official UK Charts Company. Archived from the original on 29 July 2007. Retrieved 7 June 2011. ↑ Mawer, Sharon. "Album Chart History: 1965". The Official UK Charts Company. Archived from the original on 4 July 2007. Retrieved 7 June 2011. ↑ Mawer, Sharon. "Album Chart History: 1966". The Official UK Charts Company. Archived from the original on 17 December 2007. Retrieved 7 June 2011. ↑ Mawer, Sharon. "Album Chart History: 1967". The Official UK Charts Company. Archived from the original on 17 December 2007. Retrieved 7 June 2011. ↑ Mawer, Sharon. "Album Chart History: 1968". The Official UK Charts Company. Archived from the original on 17 December 2007. Retrieved 7 June 2011. ↑ Mawer, Sharon. "Album Chart History: 1969". The Official UK Charts Company. Archived from the original on 17 December 2007. Retrieved 7 June 2011. ↑ "All the Number One Albums: 1960". London: Official Charts Company. 2010. Retrieved 26 January 2012. ↑ "All the Number One Albums: 1961". London: Official Charts Company. 2010. Retrieved 26 January 2012. ↑ "All the Number One Albums: 1962". London: Official Charts Company. 2010. Retrieved 26 January 2012. ↑ "All the Number One Albums: 1963". London: Official Charts Company. 2010. Retrieved 26 January 2012. ↑ "All the Number One Albums: 1964". London: Official Charts Company. 2010. Retrieved 26 January 2012. ↑ "All the Number One Albums: 1965". London: Official Charts Company. 2010. Retrieved 26 January 2012. ↑ "All the Number One Albums: 1966". London: Official Charts Company. 2010. Retrieved 26 January 2012. ↑ "All the Number One Albums: 1967". London: Official Charts Company. 2010. Retrieved 26 January 2012. ↑ "All the Number One Albums: 1968". London: Official Charts Company. 2010. Retrieved 26 January 2012. ↑ "All the Number One Albums: 1969". London: Official Charts Company. 2010. Retrieved 26 January 2012. ↑ "Artist Chart History". London: Official Charts Company. 2010. Retrieved 26 January 2012. Warwick, Neil; Kutner, Jon; Brown, Tony (2004). The Complete Book Of The British Charts: Singles and Albums (3rd ed.). London: Omnibus Press. ISBN 1-84449-058-0.